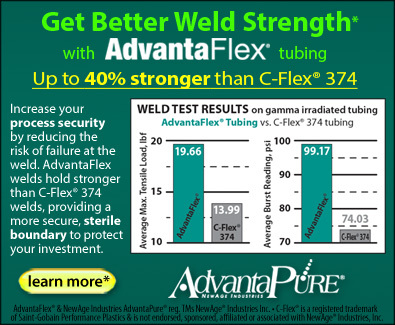 AdvantaFlex addresses the need for a flexible, translucent, sterilizable, moldable, heat sealable, and weldable biopharmaceutical tubing for fluid processing. AdvantaFlex TPE tubing maintains its physical properties following sterilization processes, resists kinking, remains translucent for visible product flow, and does not become gummy. Sizes from 1/8" (.125) through 1" (1.000) I.D. your pharmaceutical, biotech, medical, or other critical processing application. 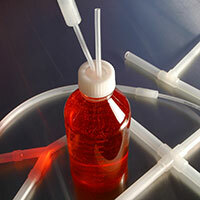 Because of its ability to be sealed and welded, AdvantaFlex is ideal for filling and sampling applications. Sold by standard lengths only. Add length suffix code to product number when ordering—see the Coil Length Legend at right for length suffix codes. Example: a 50 foot coil of .125 inch I.D. x .250 inch O.D. tubing is product number APAF-BP-0125-0250L. Add length and "S" to denote "spool" for products with lengths available on spools. Example: a 500 foot spool of .125 inch I.D. x .250 inch O.D. tubing is product number APAF-BP-0125-0250-500S. Working pressures are calculated from burst testing using a 3:1 safety factor. Coils and spools are supplied double bagged in heat-sealed polybags and bulk packed. Contact your AdvantaPure Sales Representative for other packaging options. Download a printable version of the AdvantaFlex Datasheet.